How cool is that? 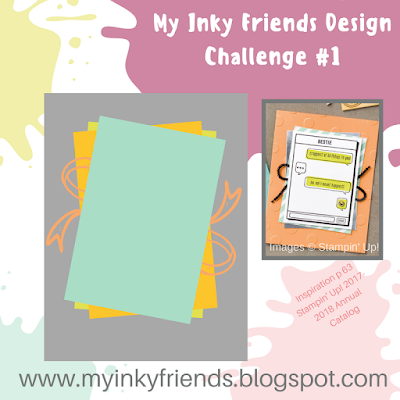 My Inky Friends and I have started something new-- a monthly design challenge. 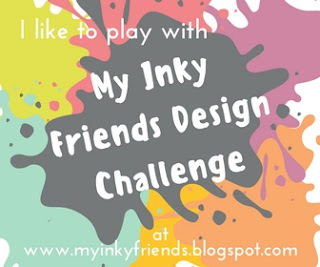 On each fourth Friday of the month (this month is the exception) a new challenge will post on the My Inky Friends Blog and I will also post my creation here! You can play along at any time, but if you want to be in the contest, then you need to post your creation within two weeks. Our design team will vote and announce the next week! Between challenges, we will still have monthly blog hops on the second weekend for even more inspiration! Our inspiration always comes from Stampin' Up! As demonstrators, the best ideas, newest products, and trendy designs are accessible to us. But, they are also accessible to customers via the catalogs. So, our challenge gains inspiration from a page of a current catalog. Our first challenge comes from page 63 of the 2017-2018 Annual Catalog and is a sketch challenge. I chose to play with my new stuff that you can purchase from the 2018 Occasions catalog after it goes live 3rd. This stamp set and the glimmer paper is part of the Myths and Magic Suite. Magical Day includes a dragon, a unicorn, a wizard, a knight and this mermaid. I love this set and can't stop creating with it! That background is pretty cool, too! I used a new product called Brusho Crystal Color. Its a fine powder that you can use to watercolor. I've just started exploring and it is quite fun! To color the Mermaid, I used Brusho, too. I just added layers of darker color using my aquapainter! I am in love. I also added a little extra glimmer with some Clear Wink of Stella. The ribbon is a Sale-a-bration item. In the Shimmer Ribbon Pack, you get 3 shimmery ribbon spools--a Basic Gray 1/4" wide, Bermuda Bay 1/8" wide, and Calypso Coral 3/8" wide-- all for FREE with a $50 purchase. It's a perfect way to add accents to your cards! 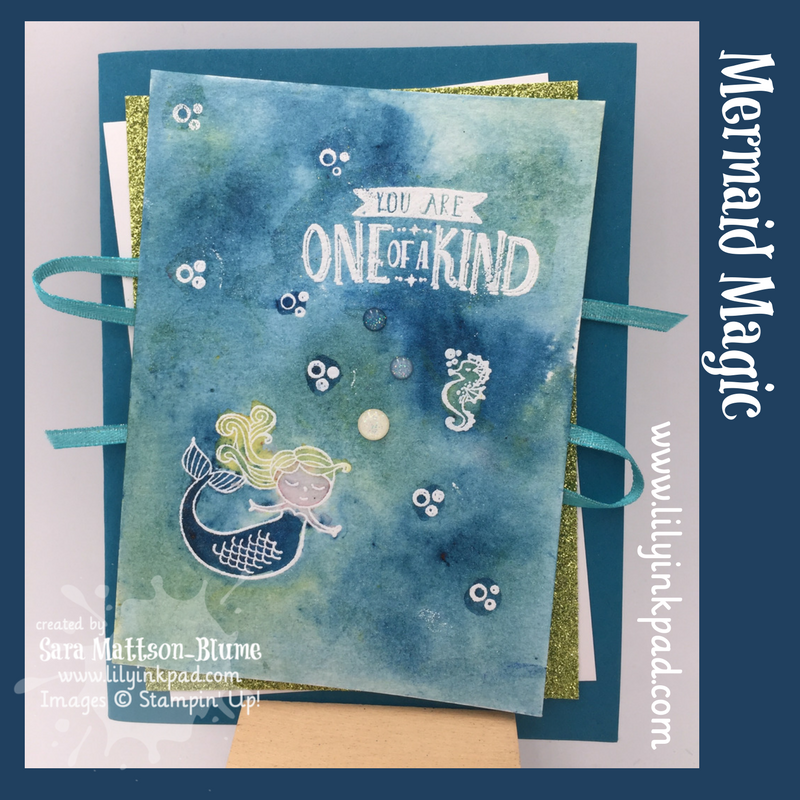 For my layers, I used the light green Myths and Magic Glimmer Paper along with a piece of Glossy White. It's pretty cool to see in person. 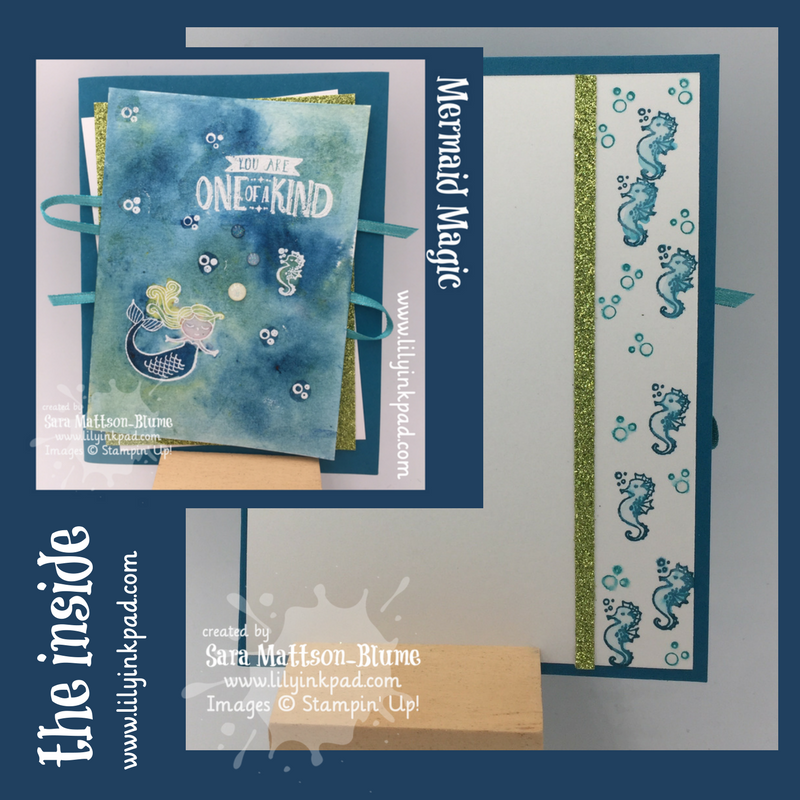 I added a strip of glimmer and some seahorses. I used my aquapainter to add a little blue to the horses. If you want to purchase these products, you'll have to wait until January 3rd. Keep your wish list handy! Your card is amazing!! Thanks so much for organizing this fun challenge! This is beautiful! The colors look just like the ocean. I can't wait to play with the Brushos! Those little seahorses are the cutest things! This is such a sweet card! And I agree, the Brusho is SO MUCH FUN to play with!!! I can only imagine how much more wonderful this card is in person because it's fabulous in the picture! Your card is awesome! Thanks for organizing this awesome challenge I am really looking forward to it this year! Super Cute card! Thanks for the challenges. You rock!